GREATER HARTFORD'S BUSINESS NEWS WWW.HARTFORDBUSINESS.COM VOLUME 26 • NUMBER 14 $3.00 APRIL 2, 2018 Second Act In season No. 2, the Hartford Yard Goats are back with more entertainment and sponsors. PAGE 6 THE LIST: Largest women-owned businesses in Greater Hartford Newsmakers Samantha Wanagel, General Manager, Upward Hartford. PAGE 3 PAGE 10 Hiring Spree Indian IT firm Infosys' plan to hire 1,000 workers in Hartford will test the state's and region's tech talent pipeline. PAGE 8 Hartford's Storyteller New MetroHartford Alliance CEO David Griggs wants to share the region's economic message globally. 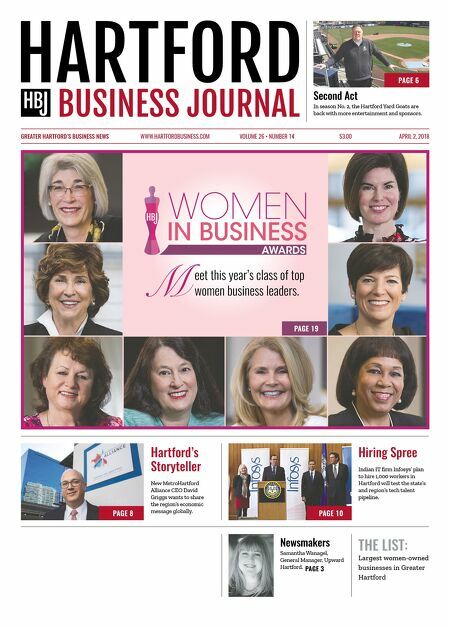 PAGE 19 M eet this year's class of top women business leaders.